Could you use a little help from The Force with your gift-giving this holiday season? Well, we might have a few ideas to get you started… And the best part is you don’t have to go to a galaxy far, far away to nab them! 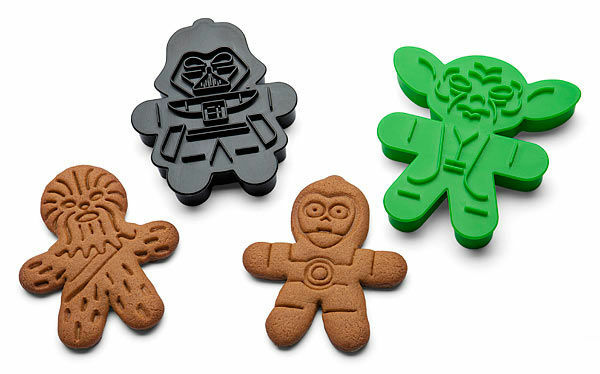 ’Tis the season for all things gingerbread men… but what about the oft overlooked gingerbread sith lord, hmm? These Star Wars Gingerbread Cookie Cutters include Darth Vader, a Stormtrooper, Boba Fett, Chewbacca, Yoda, and (the cutest ever) C-3PO. 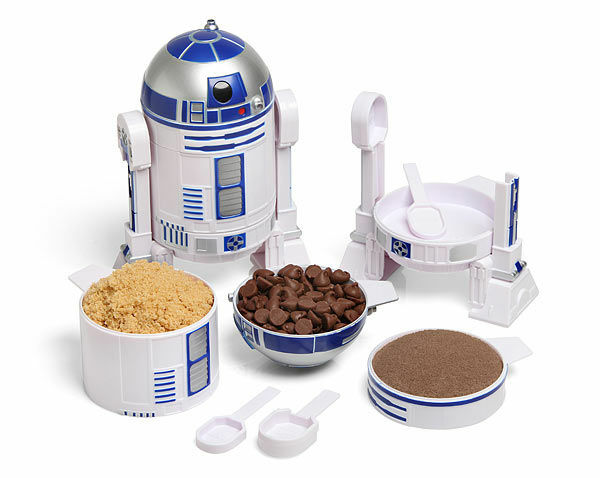 What could be more helpful than having a droid in the kitchen while baking up all those cookies? This R2-D2 Measuring Cup Set includes 4 measuring cups and 4 measuring spoons. 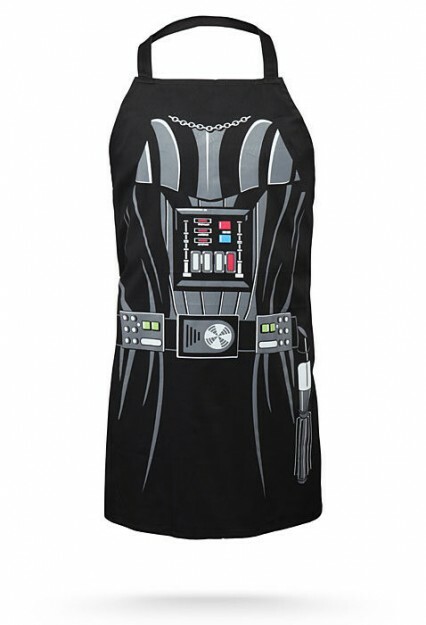 This Darth Vader Apron is for the cook who really likes to be in control of their kitchen or grill. “Your feeble skills” may be no match for the Dark Side, but if you can use chopsticks, you’re still one up on lots of opponents. 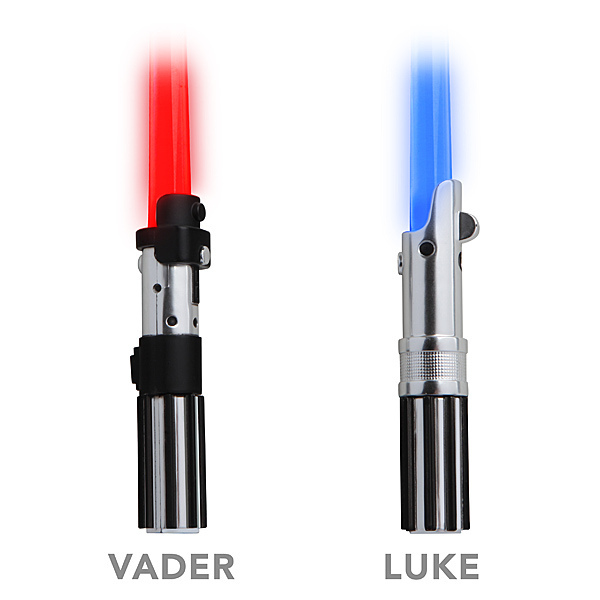 Light up Chop Sabers come in blue (for Luke Skywalker) or red (for Darth Vader). And what will you eat with your Chop Sabers? 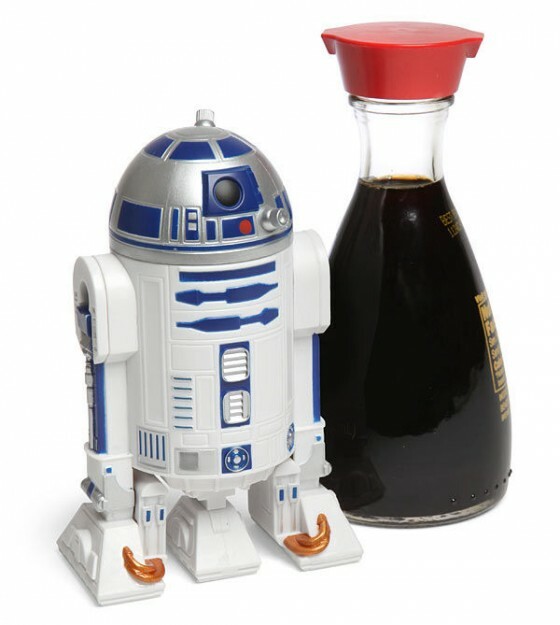 Something that would be mighty tasty with some soy sauce, no doubt, poured straight from an R2-D2 Soy Sauce Dispenser. Indeed. A Lightsaber may indeed be an “elegant weapon for more civilized days.” But why should that mean it can’t come in awfully handy at the grill? 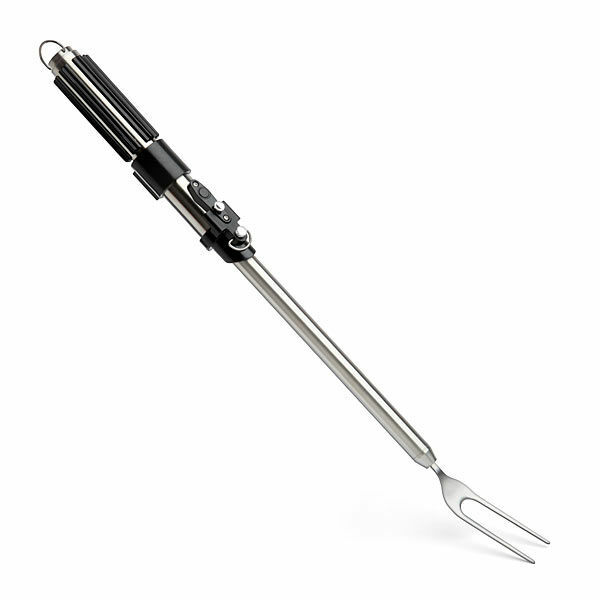 The Lightsaber Barbecue Fork could be just the thing for the Grill Master in your corner of the galaxy. Subtle. 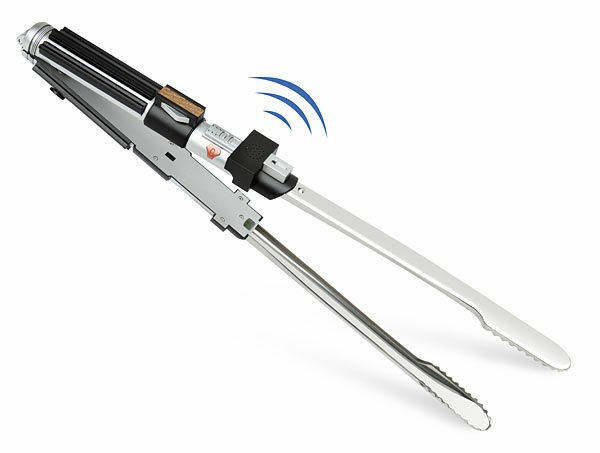 And there are even Lightsaber Barbecue Tongs to match! With lightsaber sound effects, no less!! And while we’re on the topic of outdoor cooking, the Grill Master might need some help keeping cool by the flames. 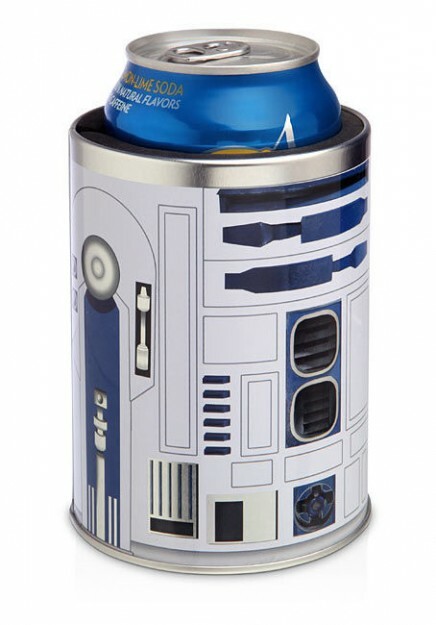 This R2-D2 Can Cooler could surely help with that! I don’t know how Darth Vader would feel about being associated with something as cozy as tea time, but this one sure makes me laugh. 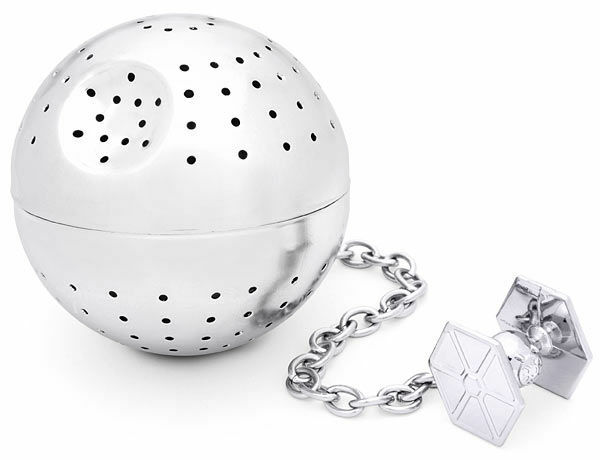 Infuse your tea with just a touch of darkness using this Death Star Tea Infuser. 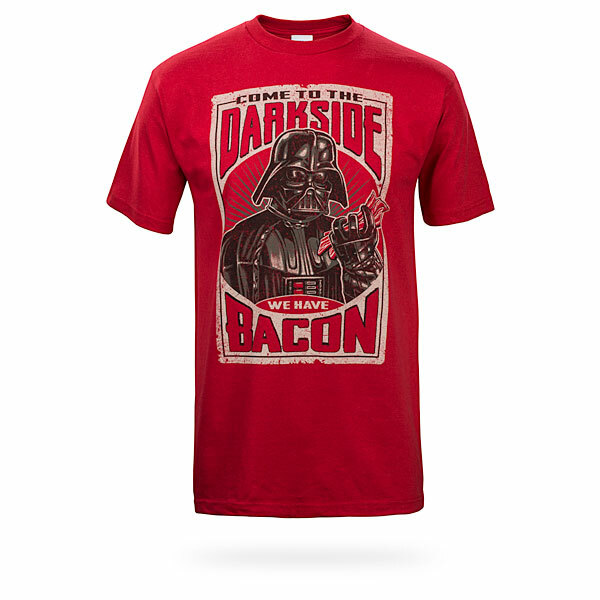 Okay, so I can’t claim this “Come to the Dark Side, We Have Bacon” T-shirt as a kitchen accessory, but C’MON! Do any of these items speak to your inner-Padawan? Please let us know with a comment! 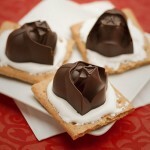 Friday Fun: Star Wars and Marvel Kitchen Goodies! 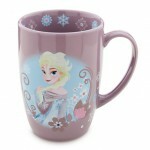 Disney Holiday Gift Guide 2014: Disney Mug-a-Palooza! My son is getting that T-shirt for Christmas! My husband would wear that T-shirt. AJ, thank you for these fantastic Christmas gift ideas!! That t-shirt will be a huge hit for two of the men on my list! The order is in process as I type! The tea ball is hilarious. Omg!! I luv em all & want em all! !